Rotational grazing involves the frequent movement of groups of stock through a series of paddocks and allows small landholders to decide when and for how long a pasture will be grazed and rested. Small landholders must consider the pasture composition in their paddocks, how this affects grazing and at what stage to remove stock from a paddock to ensure adequate ground cover remains and allow pasture to recover. Grazing method is a technique of grazing management used to achieve a specific objective. Farmers can often become confused when confronted with the large range of grazing methods (e.g. set-stocking, rotational grazing, strip grazing, cell grazing, etc.). Historically, set-stocking was the only grazing method used with annual pastures. All of these grazing methods fall on a continuum between the two extremes of (strict) set-stocking and intensive rotational grazing. Under (strict) set-stocking, animals remain in one paddock for the whole year and the pasture receives no rest. Very few producers use this grazing method in its strictest sense, but most do leave stock in the same paddock for long periods, especially during the growing season. In contrast, rotational grazing involves the frequent movement of groups of stock through a series of paddocks. Set-stocking enables the animal to control where, when and which plants it eats, whereas the higher grazing pressure of rotational grazing means the animals have less ability to choose. Rotational grazing also allows the producer to decide when and for how long a pasture will be grazed and rested. With most perennial species, some form of rotational grazing is essential to ensure persistence in the medium to long-term. A number of studies have demonstrated that the density of perennial pastures declines rapidly under set-stocking. Kikuyu is an obvious exception as it persists under set-stocking and can respond to high grazing pressure. There are a number of species including tagasaste and some of the temperate perennial grasses that persist under set-stocking with cattle but not with sheep. In the case of annuals it is important to understand how grazing management will influence seedling establishment and seed set. Deferring grazing following the break-of-season will allow annual seedlings time to establish and in spring, aerial seeding annuals time to set-seed. In the case of subterranean clover hard grazing in spring stimulates greater seed set. Feed on offer (FOO) is the amount of pasture in front of an animal at any one time, measured in kilograms of dry matter per hectare (kg DM/ha). This refers to the total amount of pasture present if cut at ground level and includes both green and dead material. FOO is a balance between pasture growth and the removal of pasture by grazing animals. It is a useful indicator for managing both animal and pasture production. animal intake – one goal could be to maintain maximum intake and therefore liveweight gain by moving livestock once FOO falls below 2000 to 2500kg DM/ha to a paddock with greater FOO. Grazing method is a critical factor in efficient pasture and animal management, particularly when maximising pasture utilisation and livestock performance. average stocking rate (i.e. grazing days/ha) stays the same. use large mob size to encourage herding. In reality, no single grazing method can meet every animal and pasture objective. The best approach is to use a grazing method that suits your livestock and pasture goal. Given that your goals will change throughout the year so will the grazing method employed. For example set-stocking is best for achieving the highest growth per head, while rotational grazing the best growth per hectare. Optimising pasture production depends on controlling two variables: the residual FOO following grazing and the length of time pastures are allowed for regrowth. In general, the higher the FOO the higher the potential growth. If residual FOO is too low, pasture growth will initially be slow due to the low leaf area available for photosynthesis. If the period of regrowth is too short, then pastures will only experience high growth rates for short periods or not at all. Conversely, feed quality declines as plants mature, so there can also be a trade-off between biomass production and quality. All grazing methods with the objective of maximising production involve ongoing monitoring of pasture growth and using indicators to maintain the optimum FOO for pasture growth for the longest possible time, for example grazing at the three-leaf stage. It is commonly thought that rotational grazing results in more pasture dry matter production and as a consequence allows higher stocking rates. In recent comparisons between set-stocking and rotational grazing in which production was optimised, the stocking rate was 5-15% higher with rotational grazing. 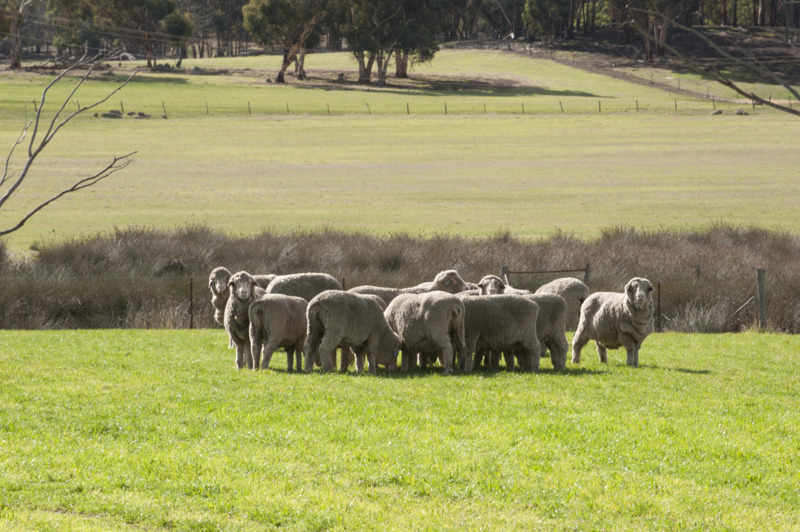 The liveweight gain per head was lower under rotational grazing in prime lamb studies, but there was little or no difference in wool cut per head in trials involving Merino wethers. In general, when pasture availability is non-limiting, livestock production per head will be higher with set-stocking as it allows animals to select a high quality diet. However, this may lead to the loss of the most palatable/highest quality species in the pastures so that in the medium to long-term animal production will decline. The combination of high stocking rates and set-stocking can lead to an increase in the subterranean clover content, which can also improve performance per head. In contrast, rotational grazing usually leads to an increase in the grass component, which increases production per hectare. Large paddocks often contain areas of pasture that are ungrazed or grazed infrequently. If large paddocks are subdivided and rotationally grazed, pasture that was previously under-utilised will be consumed – leading to an increase in production. A similar result can be obtained by grazing large paddocks with big mobs, thus reducing selective grazing by livestock. Rotational grazing can be used as a tool to assist in the control of internal parasites, either by using cattle to clean up a pasture for sheep or ensuring that livestock are not exposed to heavy worm larvae pick-up. This requires planning and an understanding of larval survival patterns. Rotational grazing can be a great way to allow producers to decide when and for how long a pasture will be grazed and rested.